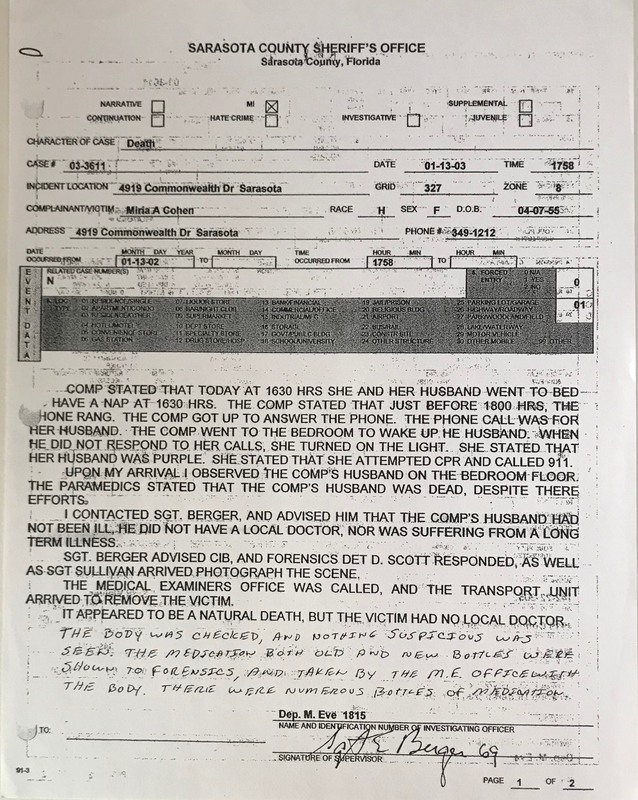 Confirms Murray was alive and pleading for an ambulance when Maria Amurrio reported to the 911 operator Murray was not speaking, breathing, and "totally gone"
Amurrio told a different story to Murray's family in New Jersey about the circumstances surrounding how Murray died. Who is Maria Amurrio (Cohen)? *Head of Women Police for home country of Bolivia before immigrating to USA. *Special Narcotics Agent for Bolivia. Is Amurrio a Federally Protected Informant? Murray Cohen's stock broker in New York City had a pre-arranged phone appointment to speak with him on 1/13/2003. The stock broker called during Murray Cohen's murder and heard him screaming in the background. Murray's next door neighbor told authorities that she was certain that she saw Murray Cohen at his mailbox at 5:15 pm. Stephen Beninati was Murray Cohen's stock broker in New York City. As fate has it, Mr. Beninati had a pre-arranged appointment on January 13, 2003. Mr. Beninati called during Murray Cohen's murder. Please see video despoition below.